What Are the Common Symptoms of Chronic Fatigue Syndrome? Chronic Fatigue Syndrome has a range of symptoms, some of which are similar to other conditions, which all serve to create confusion in getting this illness diagnosed in a patient. But there are some common symptoms of CFS that have over the recent decades been accepted as being symptomatic of this condition. Chronic Fatigue Syndrome is associated with myalgia and arthralgia, cognitive difficulties, chronic mental and physical exhaustion and other distinctive symptoms in a person who was previously healthy and active. While many other diseases may have a common symptom of fatigue, in the case of CFS, it is a multi-systemic disease. CFS can often begin suddenly and mostly after the attack of cold, bronchitis, hepatitis or an intestinal bug. Sometimes taking a course of antibiotics to fight these bugs will be a trigger as well. In some others CFS will be followed by the attack of infectious mononucleosis or mono which will drain out the energy temporarily from many teenagers and young adults. In some cases the syndrome will start during a period high stress. This syndrome will develop gradually with out any clear illness and the symptoms of CFS will come and go frequently for more than six months. The name of the syndrome shows that the illness is associated with fatigue but this fatigue is not the kind of fatigue normally people experience after a busy day or week, a sleepless night or a stressful event. The fatigue of CFS is so severe that it cannot be reduced even after a few days of bed rest and will usually be increased by any physical or mental activity, no matter how mild the activity may be. CFS affects both the activity level and stamina of the person, which in turn reduces the occupational, personal, social or educational activities. Many people are unable to continue working in their jobs while they have this condition. Some of the patients will show symptoms such as bowel irritation, psychological problems, chills and night sweats, visual disturbances, allergies, brain fog and difficulty in maintaining upright position (dizziness, balance problems or fainting). The seriousness of the syndrome is different from patient to patient as some people maintain fairly active lives while for most of the patients the syndrome limits the activities they can carry out each day. The syndrome often has alternative periods between illness and relative well being. The symptoms will reoccur in the case of patient who experiences reduction of symptoms partly or completely. The decrease in symptoms in patients will tempt them to overdo activities when they better which may worsen the condition. The list above are just some of the most common and best recognized symptoms of Chronic Fatigue Syndrome, but don't be surprised if you have only some of these listed, and more that are not on the list. It is important that you do more research about CFS and the causes as well as the remedies so that you can learn how to cope with CFS and work toward your own recovery. I have been dealing with my own case since the mid 1970's so I do know how difficult it is to beat it. Along the way I have done a lot of research and tried most of the popular treatments. Some worked for me and some didn't. You can learn more about my results on my website. There are many natural therapies now recommended for treating CFS and you just need to work out which form works best for you and your lifestyle. Find out more about Chronic Fatigue Syndrome and how you can eat yourself healthy again. Understand more about Chronic Fatigue Herb supplements and how they may be of help to improve your health and energy levels. 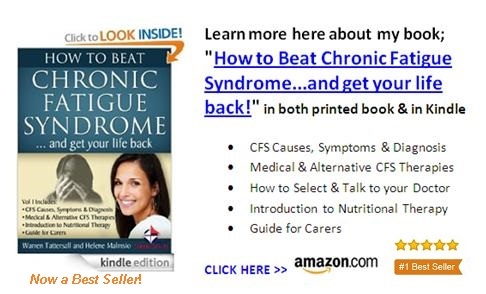 Helene Malmsio has been dealing with CFS for 35 years and has written a book available on Amazon that is devoted to helping you help yourself to better cope with Chronic Fatigue Syndrome.